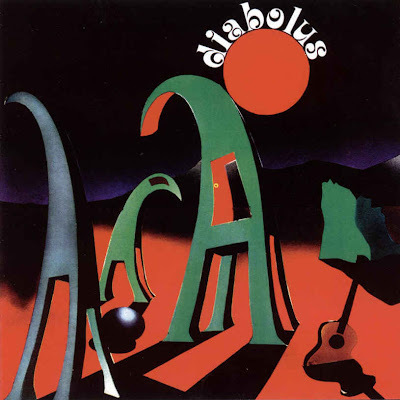 Although very little known, Oxford band DIABOLUS is an early predecessor for symphonic rock to come in the middle 70's. Their only LP, "High Tones", was recorded in 1971, in London, produced by Hugh Murphy and Shel Talmy (THE WHO); but never released because of 'commercial' reasons. An unauthorized edition was released in Germany by Bellaphon. When the members found out about this, in the mid 1990's, they legally fought back property and re-released the album with Sunrise Records, Europe). Music runs from folk tunes to excessive instrumentation, including flute, sax and chorus sang by three of the members of the band, passing through jazz-fusion and complex time composing. GENTLE GIANT's choruses run similarly to DIABOLUS'; flute sound takes them close to JETHRO TULL. Sax prefigures later PINK FLOYD sound, but while in PF sax is "invited" in DIABOLUS it comes as part of the whole. Some of the tunes approach electric jazz through the use of broken times and an open drumming, with moments of total free improvisation.